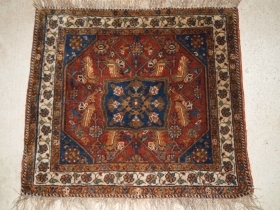 Caucasian Kuba rug, Size: 194 x 120cm. 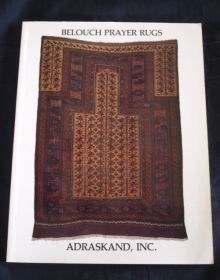 Inscribed and dated 1260 (1862) Dagestan / Shirvan prayer rug, size: 181 x 101cm. 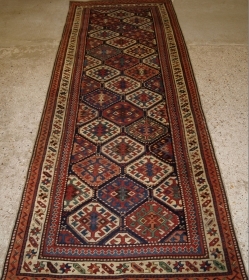 Good Shirvan rug, size: 227 x 118cm. 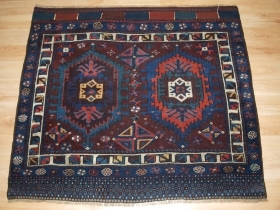 Interesting Kurdish bag face, Size: 114 x 100cm. 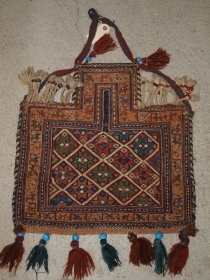 Afshar salt bag in soumak work. Excellent condition. Size: 49 x 48cm. 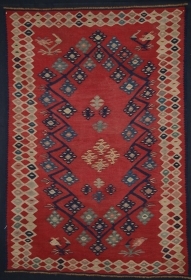 Very fine Sarkoy kilim, 4th quarter 19th century. Size: 240 x 178cm. 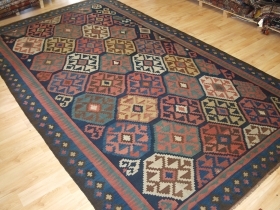 Very fine 19th century Sarkoy kilim. 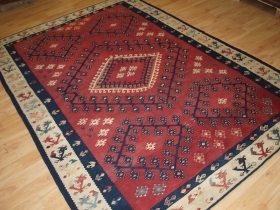 Size:240 x 178cm. 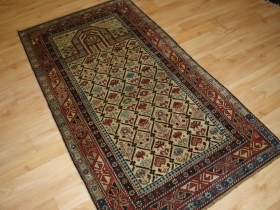 Antique Caucasian Shirvan runner link Size: 9ft 8in x 3ft 4in (295 x 102cm). 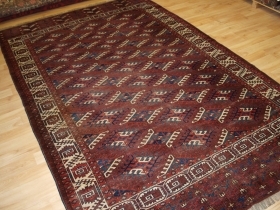 Antique South Caucasian Shirvan kilim link Size: 9ft 4in x 5ft 9in (285 x 175cm). 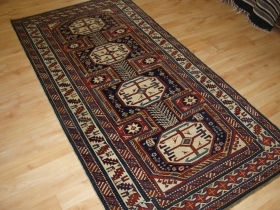 Fine Caucasian runner with superb colour, Size: 295 x 102cm. price: Please contact for further details.. 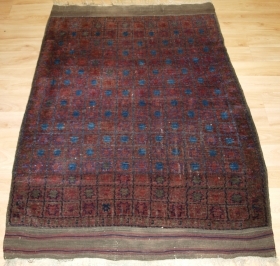 Antique ‘Jail’ Agra carpet in a Timuri Baluch design. 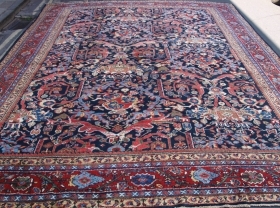 Size: 11ft 7in x 11ft 9in (352 x 358cm). 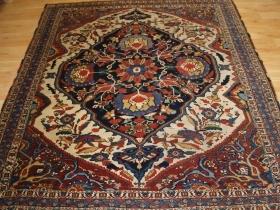 Antique Mahal carpet of large square size. 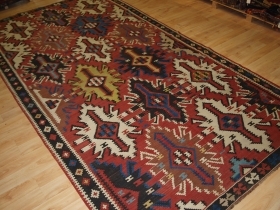 Size: 13ft 11in x 10ft 10in (425 x 330cm). 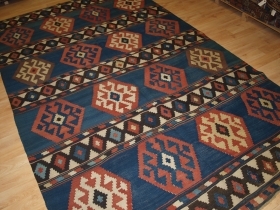 Avar kilim, Size: 328 x 170cm. 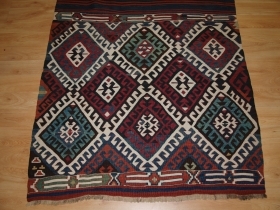 Shirvan Kilim, size: 285 x 175cm. 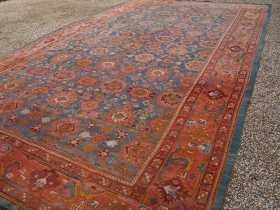 Khamseh rug, very fine with superb colour. 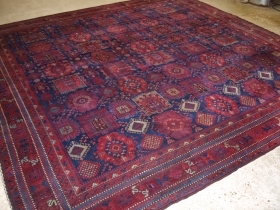 Size: 200 x 180cm. 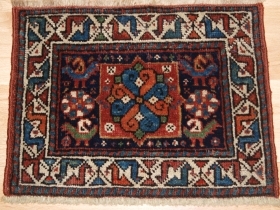 Yomut main carpet, 19th century. 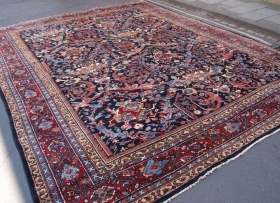 Size: 9ft 7in x 6ft 2in (292 x 188cm). 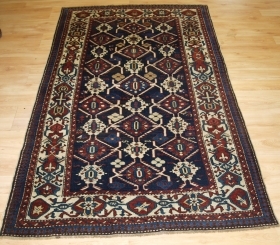 Timuri rug with 'Star & Lattice' design, superb blue, original long kilim ends. Size: 140 x 99cm. 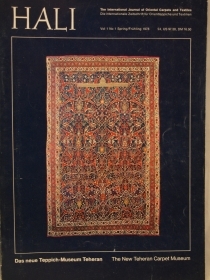 Oushak carpet, all over design, circa 1910. Size: 22ft 10in x 12ft 0in. 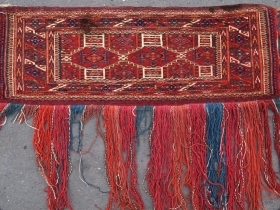 (695 x 365cm).